A man from small town British Columbia is engaged to Canadian political royalty after a whirlwind romance. A man from small town British Columbia is engaged to one of Parliament Hill's best-known faces after a whirlwind romance. John Kidder, a 71-year-old hops farmer from Ashcroft — a village west of Kamloops in Interior B.C. 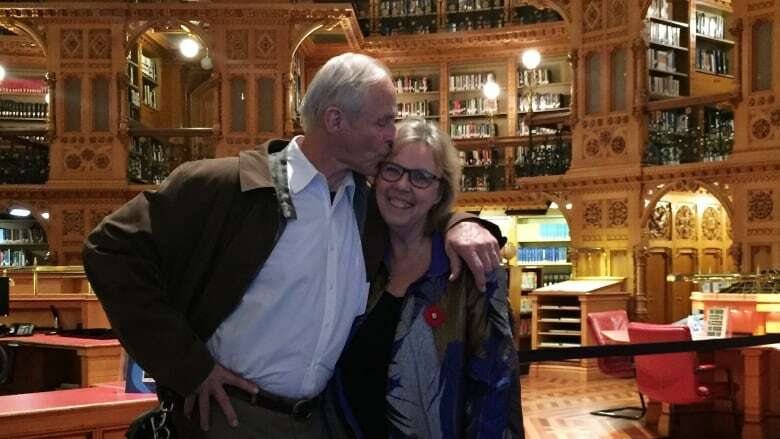 — recently proposed to Elizabeth May, 64, leader of the Green Party of Canada. Kidder said he was over the moon when she said yes. "I'm in love, I'm embarking on an entirely new life and things are just looking grand," Kidder said. Kidder himself has deep roots with the Green Party. He was one of the founders of the provincial Green Party of B.C. He initially met May through politics five years ago, while he was running as the Green party candidate in the B.C. elections in the Fraser-Nicola riding. She had come to help him campaign. "She was so gracious and so charming and so lovely that I was kind of carried away." Kidder and May crossed paths at a number of different political events over the years. It wasn't until recently, after a Green Party convention in Vancouver in September, that the couple connected. "[May] delivered a fantastic speech and I just really fell for her then in a big way," Kidder said, saying he fell for her wit, intelligence, charm and humour. The only flaw he could come up with? May doesn't put cayenne pepper in her hollandaise sauce, he said with a laugh. The two embarked on a whirlwind romance, connecting on everything from their political views to an appreciation for Pogo comics from the 1950s. After a month, Kidder proposed. "I couldn't help myself," he said. "I asked her on the telephone, it's a shame to admit, to marry me and she accepted. I made it a little more formal the next day in the Parliamentary Library in Ottawa." He said he had no qualms about jumping straight to marriage. "There's no point going slowly at this point in our lives, good heavens," he said. The couple plan to marry in Victoria on April 22, which is Earth Day, and then take a train from Vancouver to Ottawa for their honeymoon. "We haven't yet found something that we don't do together where we seem to complement each other in every way possible. It's just grand," he said.